The rise in the number of two-wheelers in Jaipur over the last few years has been alarming. Two-wheelers have been a preferred mode of transport in India for decades. It saves time, fuel and is much cheaper to purchase. However, with so many vehicles on the road, it is important to have an insurance policy on your two-wheeler. An insurance plan can safeguard you financially if something were to happen. You can opt for a liability-only policy or a comprehensive package. Comprehensive cover offers protection against damages to self and own vehicle as well. 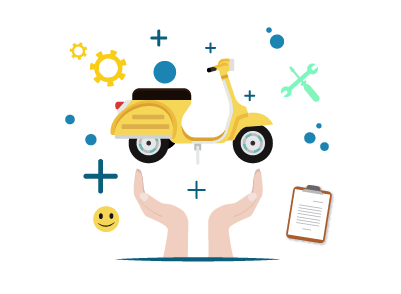 Selecting the best insurance policy for your two-wheeler can be a difficult task as there are plenty of options in the market. Depending on the coverage you require, the benefits you are seeking and the premium amount you are willing to pay, you can avail a policy from some of the popular insurance providers listed below. Cashless facility is one of the best benefits of an insurance policy. When it comes to insurance claims, there are two kinds of settlement options offered by insurance companies - reimbursement and cashless. If the customer opts to have their vehicle fixed at a non-network garage, then they will have to pay for the bill and later claim a refund from the insurer. Under cashless settlements, if the customer avails services at a network garage, then the insurance company will settle the bill directly. The customer is only required to pay for any portion of the bill that is not covered by the insurance plan, such as depreciation of spare parts. Every insurance provider ties up with different garages. To locate a partner garage to get a two-wheeler repaired, there are different options provided. Customers can call the customer support team and ask for assistance in locating a network garage nearby. The list of network garages is usually provided to the policyholder in the welcome kit or policy document. Insurance companies have the option of locating a garage on their official websites. A customer can enter their location and city to find garages in the area. No Branch Visit - With cashless settlements, customers are not required to visit the insurance branch and submit claims forms and documents. Everything is handled at the garage itself. The customer needs to provide their policy number, information about the incident leading to the claim and submit any documentation necessary. The garage will handle the rest with the insurance provider. Saves Time - When the insurance provider ties up with a garage, this shortens the claims process. Information about the garage is already with the insurer, therefore this reduces formalities and other time-consuming requirements. Out-of-pocket expenses - The bill for repairs will be settled by the insurance company directly with the garage. The customer will only be required to pay for any part of the bill that is not covered by the insurance plan. This greatly reduces any financial burden on the policyholder. Quality - When fixing a bike at an unknown garage, you might fear the risk of them replacing parts with duplicates or damaged ones. At network garages, since they are tied-up with the insurer, this shouldn’t happen. When it comes to insurance, the best policy is relative to the customer. Different policies available in the market are designed to cater to the varied needs of customers. Premiums differ between each person and between vehicles. Many factors come into play while determining the required coverage and the cost of the plan. When trying to find an ideal bike insurance policy, there a few important things to consider. There are two types of cover offered by insurance companies for two-wheelers: liability-only and comprehensive cover. While a liability-only policy provides financial protection against third-party liabilities, a comprehensive package will also cover own damages and injuries. A third-party liability policy is mandatory by the Government of India. It is advisable to choose a comprehensive package to be fully protected in the event of an accident. Many factors play a role in determining the premium of the insurance plan. Premiums are the amount you need to pay to purchase the plan. Insurance providers will take into consideration the make and model of the bike, the cubic capacity, the city of registration and purchase, the details of the driver and so on. A no-claim bonus (NCB) is a discount awarded to customers who do not make a claim during the policy term. When a customer renews the two-wheeler insurance policy, the insurer will provide a discount on the premium amount. NCB is non-transferable between policyholders, but can be transferred between different insurance providers. NCB is 20% for the first claim-free year and subsequently increases to 25%, 35%, 45% and 50% maximum. Insurance providers usually have limits on the amount you can claim in the event of an accident. For third-party death claims, there is usually no limit but for damage to third-party property, the claims are capped at Rs.1 lakh. The cap on claims for self will depend on the sum assured selected by the insured. There are two types of claim settlements - reimbursement and cashless. If your insurance provider offers cashless settlements, you will not be required to pay from your own pocket for the repairs. The cashless option saves time and the hassle. It also reduces the financial burden you may have to bear. Insurance providers give policyholders the option of transferring the insurance policy when they sell the bike. If you choose to sell your two-wheeler, you need to transfer the ownership of the bike to the next owner. By doing this, you will ensure that you will not be held accountable for any future liabilities associated with the bike. To fulfill on legal formalities, you need to inform the Regional Transport Authority (RTO) of the sale of the vehicle and apply for a No Objection Certificate (NOC). You need to hand over the necessary documents to the new owner and transfer the ownership name. The Government of India made it mandatory to have a valid third-party liability plan on any two-wheeler in India. Apart from it being a legal requirement, it is smart decision to pay a small premium to ensure you are financially protected in case you are ever in an accident.